Is there any way to control squash (also gourd and cuke) vines? Is there some type of barrier they can't grow through, around or over? Every year they overtake the whole garden. Also, how far away from gourds should they be to eliminate cross pollination? If these vines are overtaking the garden, then you may want to consider growing the compact or bush varieties rather than the vining types. 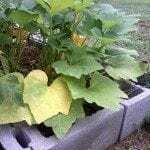 You could also grow cucumbers on a fence or trellis.